Roj Gosh Mah Fravardin, 1382 Yz. Read the first part of my tribute to my grandfather here. Read the second part of my tribute to my grandfather here. We now continue further. A short time later, my mother became pregnant and I was born in October 1970, the first grandchild in the Vagchhipawalla family. 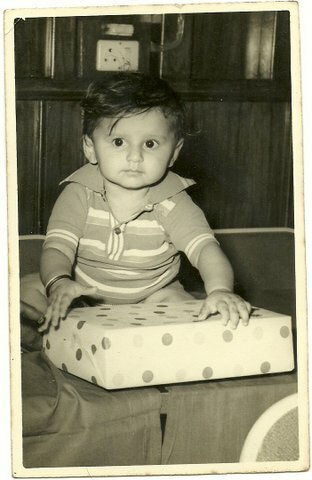 I was got to Valsad when I was only a few days old as per our tradition. As the umbilical cord withered away, it was collected and buried by Nariman papa at the wadi in Tithal, thereby sowing a long connection between that place and your author. 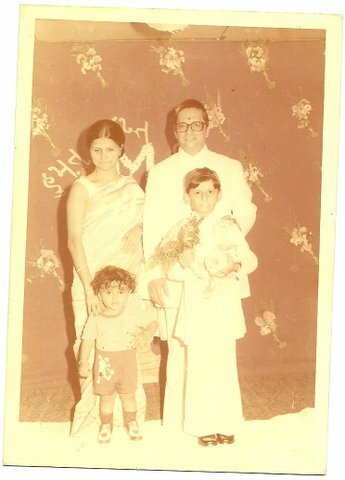 After the mandatory period of maternity leave was over, my mother returned to her bank job in Mumbai, leaving me in the capable hands of Dinamai, assisted by my youngest uncle Dhunjisha. Both parents would visit me over the weekend and on bank holidays. 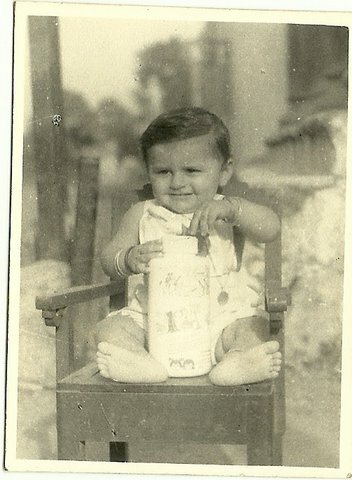 My grandfather continued his daily up-down routine from Tithal, looking after the passengers there and having a good look at his first grandchild in Valsad, ensuring that no expense was spared to raise him in some luxury, (even using Johnson’s baby powder!) unlike the days of relative poverty which were now beginning to recede. Me and my favourite Johnson's baby powder! The first months went by fast, and soon it was time for the first birthday. 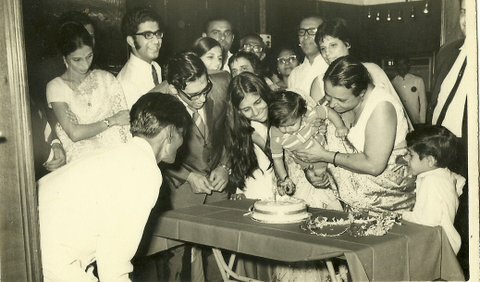 The family traveled to Mumbai to celebrate the occasion at the Heritage Hotel. Granny Dinamai holds me to cut the first birthday cake. Our Man Friday Jani is seen in the front. All except Nariman papa, who of course hated Mumbai and would not even drink the water from there! 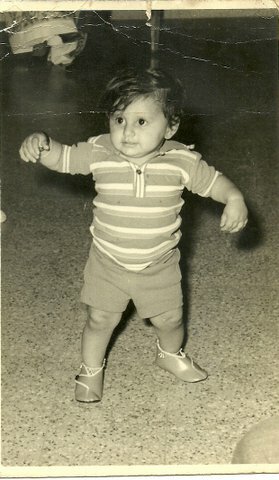 By some coincidence, I also started walking on my first birthday. After the cake cutting and the gifts, life settled down back to normal. By the age of two-and-a-half, I was packed off to a lady in Parsiwad, to begin my study of English. Soon thereafter, I was shifted back to Mumbai to begin my schooling there. But I really missed Valsad and Tithal in all those years. Every vacation would see me back there, enjoying time in the outdoors, bullying my poor grandmother with most outrageous demands and generally being pampered and spoilt as only a first-born can. 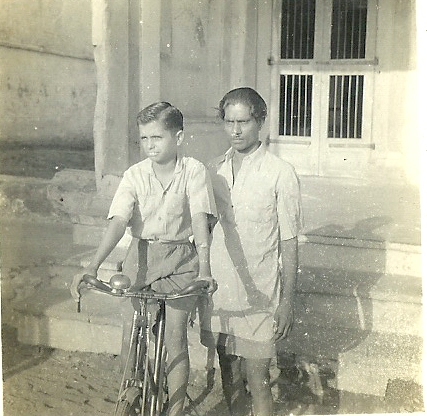 When I was about five, Nariman papa procured an old cycle from somewhere and proceeded to get it back into shape for my use. I still remember walking with him, hand-in-hand, back from the cycle repair shop, where he handed over a Rs. 100 note, for new tyres, tubes, chains, brake liners and general overhauling of the cycle. It must have been about one month’s pay for him in those days, but he had a deep satisfied look in his eyes, as though he had started something important. My uncle Dhunjisha and man Friday Jani helped me learn the ropes and soon I was like every young boy who has first experienced the freedom of being able to move faster than you can ever run, feeling the thrill of the wind flying in your face. The moment I got up, it was all about how soon I could go out and begin cycling. 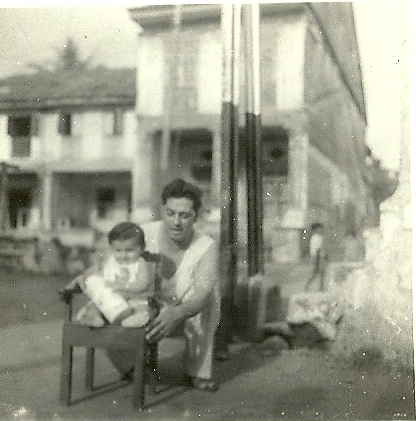 I raced through our moholla in Mota Parsiwad, going to the back street housing the residences of prosperous Parsi Seths, into the alley behind, down the steep slope, entering into the areas where the local population lived, flying around without a care in the world. The fun as I would cycle very fast, close to Dinamai, causing her to shout out: ‘drive slowly, take care, God save me from this mischievous child! What will I tell his mother if he falls down and hurts himself!’ Those years are a faint memory today, but perhaps the happiest days of my life. I was just shy of seven when my brother Homiar was born. 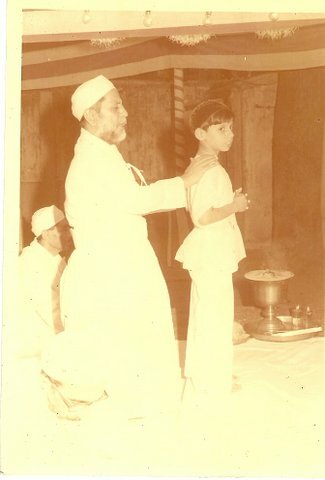 Those were days of prayer lessons and getting ready for the Navjote, which took place at Cama Baug. The whole family was there, even Nariman papa, but he refused to have any photos taken. He came with a thermos of water, dressed in his khaki clothes, and ate simple dal and rice cooked by Dinamai, and scrambled eggs in the evening, sitting far away from everyone, but paying attention to all that went on. As the function got over, he was on the late night train, back to his beloved Tithal. The Navjote was an important event, not only in my life, but also for Nariman papa. For him, it meant that I was now old enough to take on more responsibilities. 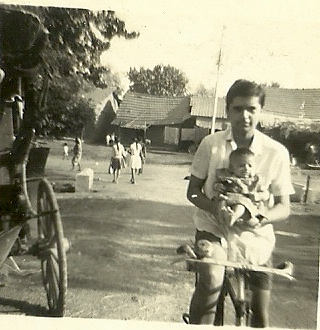 On my next vacation, he announced that from thereon, I would stay at Tithal, and cycle to Valsad every day with him. Despite protests from my grandmother – ‘who will look after him, what if something happens, what about all the snakes in the wadi…’ Nariman would not budge. As for me, I was only too glad to accompany him to the mysterious wadi at Tithal, with the glorious beach just a few metres from our house. The only compromise arranged was that I would have my bath at Valsad, since there was no sweet water in Tithal – being so close to the sea, the wells had brackish water. The drinking water had to be carried on the head from a well more than a kilometre away! The wadi at Tithal was more than 16 acres large and housed hundreds of chiku, coconut, mango and bawal trees. At one end of the wadi was the watchman’s hut, the other end was our small bungalow. About a 100 metres from our residence were two large bungalows which housed the holiday home of the bank, where passengers would come for their vacations. There were neat, well manicured lawns around the bungalows, a small playing area with swings and see-saws, and just lots of greenery all around. In the centre of the wadi was a huge well, with a pump house halfway down the side. From here, the brackish water was pumped up (whenever the electricity worked, which was not very often) to a tank, from where it flowed into the small canals made to the different parts of the wadi where the fruit trees were grown. It was an idyllic scene, totally isolated from all civilization. Although the main road passed right beside our bungalow, the only traffic were the infrequent trucks which came to carry away sand from the beach a few metres away. A rickshaw on the road meant the entire population of about 50 people would come out to see the strange contraption. All around were the wadis of rich Parsi Seths of Mumbai, which were looked after (and later taken away) by caretakers. The glorious beach was about 50 metres away from the edge of our wadi and the gentle lapping of waves or the roar when the tide came in could be clearly heard at all times. A strong breeze always flowed through the wadi, obviating the need for any fans. Despite the bungalow having two rooms and a kitchen, Nariman papa preferred to sleep on the outside otla, where he also spent most of the day. The height of the otla gave him a commanding view over the entire wadi, as also the road outside. Beside our bungalow was a very large mango tree, whose boughs covered the residence in cool shade. A small cot was placed under the mango tree and this was my sleeping area. 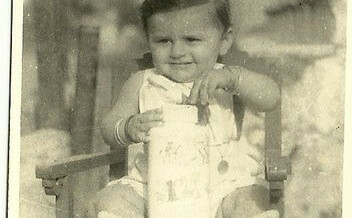 Despite a toilet and bath in the bungalow, papa always prefered to do his business in the wadi outside, taking a solitary pail of water with him. Some distance away from the house, a small brick stove had been made, where a fire would be lit and a smoky old pot filled with water to boil. Once hot, this would be emptied out into a bucket and carried to a nearby area which was cleaned out and a few broken tiles put, to make a ramshackle bath where we would have our daily ablutions. In another corner outside the hut stood a stone mortar and pestle where the daily masalas and other chutneys would be pounded. There was no TV, no fridge, no tube lights, just one solitary light bulb, and a telephone (number 2238) that was used more as a paperweight than as a communication device. When the phone did ring, it would invariably be a wrong number, so much that after some time, papa would simply refuse to answer at all! It was hilarious to hear him shout ‘Hello, hello’ and then mutter a few choicest Parsi abuses to the unfortunate person on the other end! Outside calls almost never got through. This was paradise! This is indeed a great story, some of which I know from Dhunjisha Uncle himself. I definitely recognise him on the bicycle, the only difference is now he has put on weight. Please continue the story as also the great articles of our religion, all of which are very very informative and indeed a pleasure to read. May our great religion proper once again !! Eruchasha Katrak Performed your navjote? He lived just opposite my building and his daughter is my neighbour. His son Cyrus and I were childhood friends.